More than 120,000 people attended 'March of millions', which included live performances from various musicians in between political speeches. 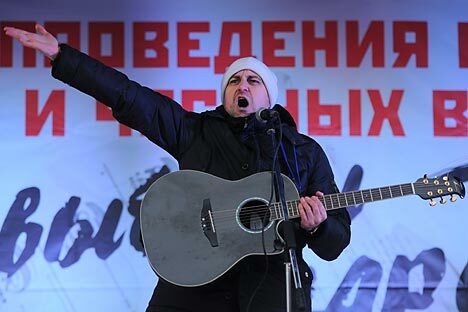 In modern Russia, we can see that almost every public rally features a music performance that can be identified as a protest song. Russian protest songs have come a long way in the past 60 years following World War II—starting with songs created by prisoners in Stalin’s Gulags, and coming all the way up to today’s punk bands. In a democratic society, people can freely express their opinions that reflect their personal view on current events. Those types of expressions can be found in various forms, such as publications, documentaries, news reports and theatre plays. The protest rock song is a very common form of expression, which started in the 1960s. The famous rock festival at Woodstock featured many protest songs performed by Jimi Hendrix, The Who, Creedence Clearwater Revival, Richie Havens, Joan Baez and others. The common motif of protest songs at Woodstock was the Vietnam War. Credence Clearwater Revival – “Fortunate Son” (1969 Woodstock Video). If we look back at modern Russian history, starting from 1945 and the end of War World II, we will not find such a wave of protest songs like we have witnessed in the last 5 years. It is also strange that there are not so many rock protest songs that came out of previous generations of Russian rockers: This means that we can’t identify a continuation or some kind of a tradition for writing protest songs. Nonetheless, here is a brief, historical review of protest songs in Russia over the last 60 years. It’s pretty obvious that, during the Soviet Union, protest songs were sponsored by the totalitarian state and were aimed at foreign enemies— i.e., American imperialism and militarism, exploitation of the working class in the capitalist system, junta types of dictatorship that suppressed the rights of the citizens. Here’s one song from this genre, dedicated to Victor Jara (Víctor Lidio Jara Martínez; 1932–1973)—a Chilean poet, writer, theatre director, political activist and member of the Chilean Communist Party who was violently murdered during a coup organized by Gen. Augusto Pinochet. The song was composed by an official Soviet composer, Igor Luchenok, who also wrote many different songs reflecting Soviet ideology, including songs about Lenin, patriotism and war. These types of official Soviet protest songs were hypocritical, because the Soviet Union itself was a notorious dictatorship, and its own people were suffering daily from harsh communist rules. There were plenty of protesters among citizens in the Soviet Union, but their protests were hidden in people’s kitchens, where, in a small company of friends, late-night whispering was going on about unfairness and repressions in the Soviet system. People were writing protest songs and hiding their message between the lines, because it was dangerous: This type of self-expression could lead to prison time. Probably the first well-known, anti-Soviet, protest songs in the Soviet Union after World War II were “Vaninsky Port” (Vanino Port), written by an unknown author in the Gulag, and “Tovarisch Stalin” (Comarade Stalin), written by Yuz Aleshkovsky. Born in 1929, Aleshkovsky was a writer and poet who was sentenced to the Gulag in the early 1950s and forced to emigrate from Soviet Union in 1979, because his Gulag song lyrics had been published in the West. He is currently living in United States. In the 1960s and 1970s, a new kind of songwriter-performer with acoustic guitars emerged on the underground scene. They were actors, scriptwriters, engineers, doctors and all other types of Soviet intelligentsia. They wrote their own material and performed unofficially at people’s homes and culture clubs. Commonly, they were called “bardy,” which, in Russian, means a man who sings his own songs accompanied by acoustic guitar. Alexander Galitch (1918-1977) was one of the beloved bards. His dark humor and politically charged protest songs led to a ban on him performing in public. His theatre plays were banned from publishing, as well. In addition, he was kicked out of the Union of Writers. All this led to his emigration in 1974 and his mysterious death in Paris in 1977. These are just a few short examples showing that there were protests songs in Russia, which used suggestive approaches to express people’s disagreement with the system. Today on Russia’s rock music scene, we can acknowledge a never-before-seen wave of protest songs written and performed by a younger generation of musicians. It’s a new phenomenon, because this new generation of protest rock musicians moved away from the typical showbiz career, where fame and fortune is an ultimate goal. Not long ago, in the mid-2000s, Moscow’s rock music scene was represented by numerous “klubnaya vecherinka” (“club parties”), where rock, pop and hip-hop groups entertained bored hipsters and “new rich” Russian businessmen and entrepreneurs. Clubs and bands were making good money—especially for doing private parties called “korporativ,” for which the club was rented for one night for a private “invitation only” party by a big bank, oil or gas company, construction company or other company with deep pockets. Some popular bands almost vanished from the public eye in the 2000s, doing only these kinds of private “korporativ,” where their fees were raised numerous times in comparison to a regular club gig. But something was quietly brewing underneath all this money, boredom, glitz and glamour. The first protest rally, called “Mash Nesoglastnikh” (Dissenters’ March), was arranged in Moscow on December 16, 2006. This led to a series of future protest rallies in the next few years in different cities in Russia. Very quickly, musicians started to participate in these Dissenters’ Marches, performing short sets on stage. Mikhail Borzikin from the band Televizor (Television Set) participated and performed at a Dissenters’ March in St. Petersburg (March 2009) with the tune “Zakolotite Podval” (“Shut Down the Basement”)—a protest song against criminals in the government and their ties with the Russian Orthodox Church. Another highly publicized series of protest rallies at the end of 2000 was associated with the defense of Khimkinsky Les (Khimki Forest) against government and private companies, which wanted to build a highway that would destroy the forest near the city of Khimki. On August 22, 2010, a concert in support of Khimki Forest was planned in Moscow’s Pushkin Square. Police forces did not allow any sound equipment to be used at this concert, which led to a big scandal; many musicians wanted to perform at this concert, but it was prohibited by the government and enforced by police. Thus, it became a spontaneous “no sound equipment” performance from several musicians who arrived, such a rock star Yury Shevchuk from the group DDT, as well as the group Barto. After this event, criminal charges was imposed on the group Barto, because one line in their song “Gotov” (“Ready”) was considered extremism under a recent addition to the Russian Criminal Code. By 2010, protest songs had become an integral part of various protest rallies in Russia. Not every protest rally can accommodate music performances, due to technical or organizational difficulties, but it is always a consideration. In the 1980s, a new Russian rock style emerged. Musicians in their twenties recorded their own tunes that sounded like Western rock, punk, blues, new wave and electronic music, using Russian language as the main tool of expression. Looking back on rock protest songs during the 1980s, the Leningrad group Televizor and its leader Mikhail Borzikin made songs that were very different from other Soviet underground bands; there was political protest in them. Very quickly, Televizor faced problems with censorship, because certain songs of theirs were not “zalitovany” (“approved” by a censor). Televizor performed these songs anyway, which lead to a six-month ban on their live shows in Leningrad’s Rock Club. All these problems with censorship that Televizor faced existed during the time of Gorbachev’s perestroika, which had declared more freedoms, liberties and openness in society. It shows that, in Russia, civil liberties and freedom of expression are allowed to a certain degree. Another song by Televizor from the 1980s that created a lot of controversy was called “Your Father is a Fascist.” Everybody understood that it was aimed at Soviet bureaucrats and communist’s nomenclature, regardless of what they said about democratization and freedoms during perestroika. Due to the political charge in their songs, Televizor never saw radio air play or TV presence in the Soviet Union or even in today’s Russia. The biggest protest rally in recent history in Moscow happened on December 24, 2011. This rally demanded new, fair elections that were not fixed. During Duma elections on Dec. 4, massive fraud was uncovered by activists, making the elections and the fraudulently elected representatives from the United Russia party illegitimate. More than 120,000 people attended this rally, which included live performances from various musicians in between political speeches. The nature of modern Russian protest songs is very eclectic. Songs can be inspired by a certain event—for example, a highly publicized car crash in Moscow on Gagarin Square, where a small car was smashed in a head-on collision by a black Mercedes limo carrying the vice president of the Lukoil oil company, Anatoly Barkov. As a result of the crash, two women in the small car died. Prior to the presidential elections in March 2011—where Vladimir Putin was expected to be elected again without any real competition—opposition activist Alexei Navalny announced a music video contest for songs about these “Crookes and Thieves” elections. The winner of this contest was a group called Rabfaq, with a humorous protest song with the lyrics “Our loony bin is voting for Putin.” Rabfaq has also appeared to perform live at various protest rallies. Hip-hop artist Vasya Oblomov writes smart tracks full of criticism of the current system, using various techniques that incorporate various elements from jail songs to a light comedy. Oblomov calls out names and makes critical remarks about Putin in a song called “VVP”—Putin’s initials. The video features two well-known, Russian TV personalities: Leonid Parfyonov and Ksenia Sobchak. Punk-rock group Louna wrote their own manifesto, calling on young rock musicians to wake up. “Replacing the criminal kingdom of the 1990s and the moral ruins of the 2000s, Time X has come—angry and active 2010s,” as the lyrics go. Louna performed at the March of Millions protest rally in Moscow in June 2012. In recent years, more and more anti-America and anti-West rhetoric can be heard in various government-controlled media outlets—from numerous TV shows reminiscent of Soviet propaganda during the Cold War, to brand-new laws that forbid the adoption of Russian orphans by American families. Protest activists are calling these types of policies an attempt to distract public attention from large-scale theft of state property, money and resources by “friends of Putin.” According to protestors, the goal of these distractions is to get society to pay less attention to domestic corruption and blame America for its problems.